Four Elements Design: Favourite Things...I Heart You! Yippee, it is Favourite Things time again! I look forward to every Wednesday. Too bad it only comes once a week. With Valentine's Day just around the corner, we are focusing on hearts this week. This collection is not your typical Valentine's merchandise and that is why I love it. Enough about that, here they are...my I heart you favourite things! 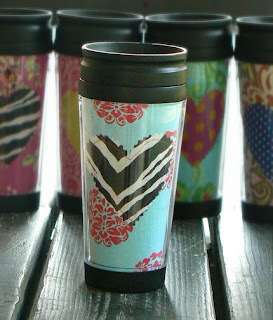 Garden House Boutique's Valentine's Day Travel Mug is the perfect way to start your day with style! The description says, "Wake yourself up in the morning with fresh coffee in a fun mug." What a great surprise for your special someone. Include a gift card from their favourite coffee shop and earn extra brownie points! To get your very own mug go to http://www.gardenhouseboutique.etsy.com/. How cute is this Personalized Valentine's Baby Hat!!! It doesn't hurt that the baby is absolutely adorable! The Cotton Cupcake Shoppe has everything you need for your baby's 1st Valentine's. It really is the perfect way to celebrate love. To visit their shop on Etsy go to http://www.cottoncupcakeshoppe.etsy.com/. This necklace from Pretty Little Me's shop is not your average cutesy Valentine's jewelry. The pendant reads, "I carry your heart" and is accompanied by a heart locket with room for two pictures. I must admit it melted my heart when I came across it! 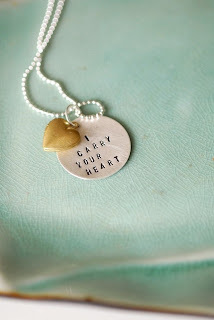 To get this necklace for your special someone go to http://www.prettylittleme.etsy.com/. How sweet are these little heart scrubbies? Now not only can you give the gift, but you can make it yourself. 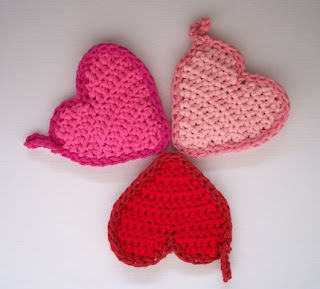 Laura's Left Hook shop offers the pattern to make these cute heart scrubbies. Head over to http://www.lauraslefthook.etsy.com/ to get the pattern to make your Valentine's scrubbie! Thanks for checking in for the latest collection of Favourite Things. I'm already excited for next week! eek!! i am so flattered!! thanks for posting about my necklace!!! seriously, reading your kind words warmed my heart!!! thanks so much!! ps, i will have to keep an eye on your blog for sure!!! you have nice taste! !